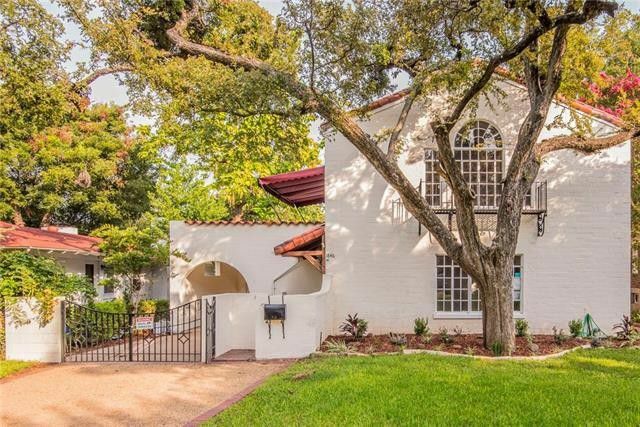 Our Saturday Six Hundred is a gorgeous Venice-style Spanish mansion in the Stevens Park neighborhood of North Oak Cliff is just waiting for your Christmas tree and garlands. And the beautiful 1846 Mayflower Dr. probably has some stories to tell, too, since it was built in 1928 by the architecture firm Flint & Broad, who were also responsible for many other buildings and homes in Dallas, including the Masonic Temple on Harwood Street, and parts of the aquarium at Fair Park and the original Love Field passenger terminal. The firm also designed a Highland Park home on Versailles Avenue, and the Medical Arts Building in Shreveport, Louisiana, and the Black Hotel in Oklahoma City. Thomas Broad and Lester Flint established their firm in 1923. Not much is known about Flint, other than he had served as president of the North Texas chapter of the American Institute of Architects during the Depression, and served as one of the first members of the State Board of Architectural Examiners. 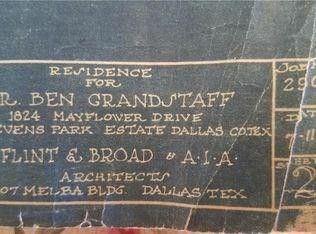 More is known about Broad, who was born in Paris, Texas, and got his undergraduate degree in architecture from the University of Texas at Austin before attending Harvard for graduate school, leaving to go back home after a fire destroyed downtown Paris in 1916, where he helped with the rebuilding effort.